Hello, everyone! 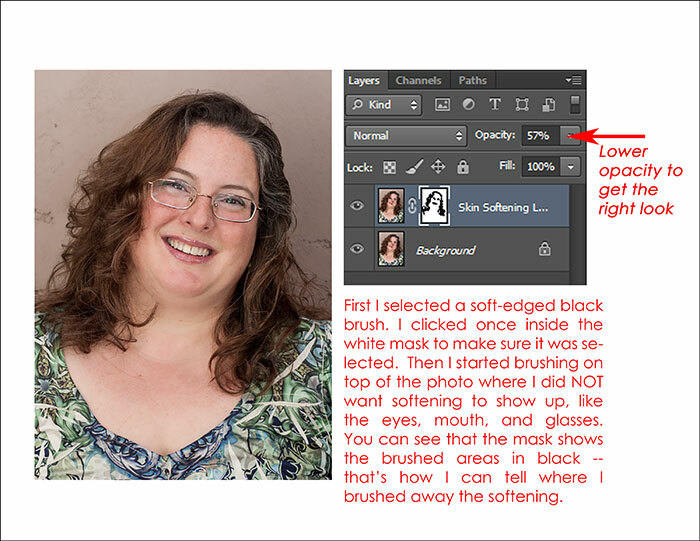 Today I want to teach you how to soften skin on a Photoshop portrait. You may have noticed that the extremely high resolution of today’s digital cameras mean that every pore, wrinkle and blemish is quite faithfully reproduced and possibly even made more prominent, depending on the lighting. I often rely on Photoshop techniques to soften the skin to a more gentle look for professional portraits. 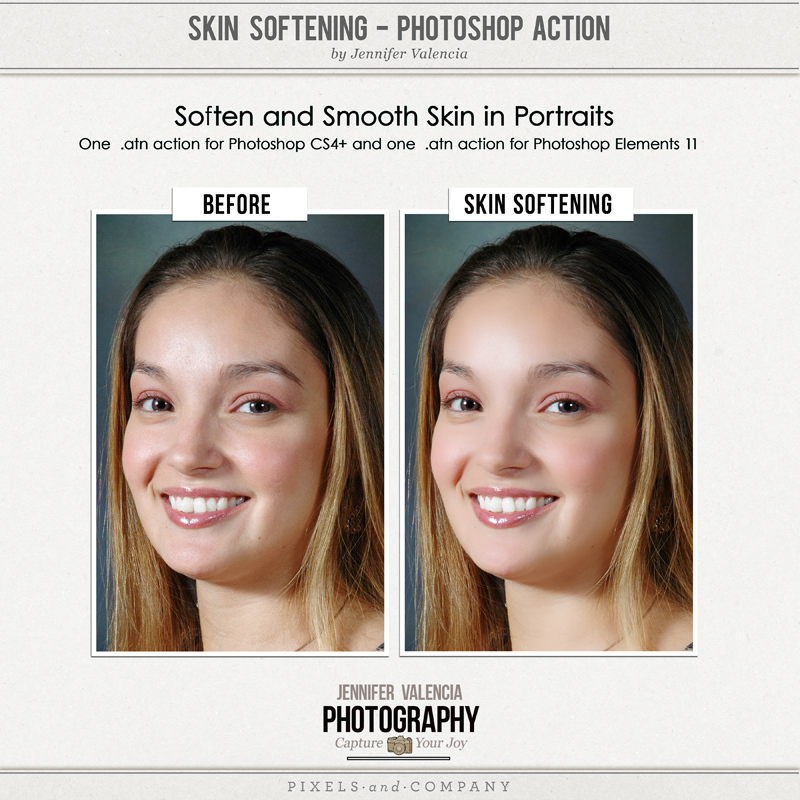 I do sell an action to soften skin at Pixels & Co., and of course I’m going to market that here (ha! ), but I’m also going to give you a tutorial on how to do it yourself, too. There are several common techniques that I’ve found from researching the web and books on Photoshop editing: Surface Blur, Gaussian Blur, and the green channel technique. It’s ALWAYS important to do the softening on a separate layer and mask it in. That means to apply it just where you want it, like on forehead, cheeks, neck — NOT on the eyes and mouth, where you want sharp details & shine. First step: open a portrait that might benefit from some skin softening. Here’s a picture of me. As you can see, I have the dewy skin of a 19-year-old model (<—SARCASM ALERT! ), but just for the heck of it, let’s apply some softening anyway. 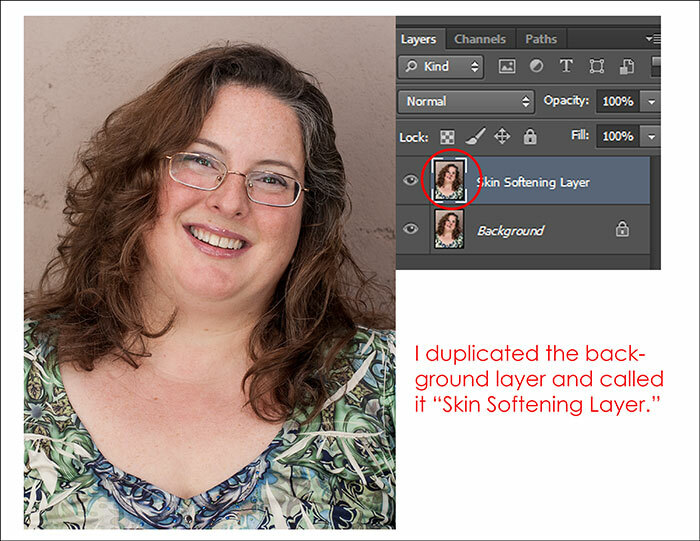 I start by duplicating my background layer and renaming it as Softening Layer. Next, I’m going to use the Surface Blur technique on the Skin Softening Layer. To do this, select FILTER from the top menu bar on your Photoshop screen. You’ll select FILTER, BLUR, and SURFACE BLUR. A dialog box will pop up. Enter Radius = 14 and Threshold = 6. Now you’ll see that the entire picture looks softer and a bit blurrier. In fact, it will probably be TOO blurry. Here’s now to fix it. We’re going to change the opacity of the layer to where it looks just right (this will vary with each photograph you adjust, but start at 50% and see if you like it.) We will also add a mask to the softening layer. Then we will brush away the areas that should NOT be soft — places like eyes, skin, eyebrows, hair. This is a quick and easy technique to gently soften skin on photos with harsh, direct light that make pores and wrinkles look too apparent. Just be careful not to over soften the skin. 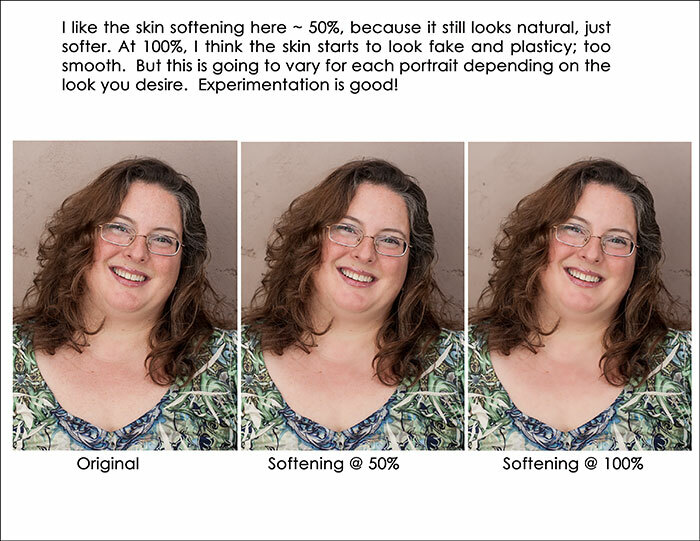 Using the softening at 100% can look plastic and fake. Adjust opacity of the softening layer until it looks right to you. I always want people to look at the picture and say, “Wow, I look good!” instead of, “Yikes, what did she do to my skin?” Click on the picture below to enlarge it so you can see the differences between them. 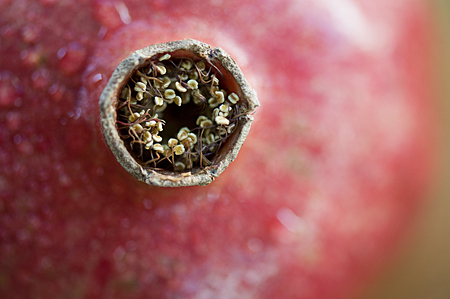 There are more elaborate techniques to soften skin, too. One that I love involves splitting the picture up into its component channels (red / blue / green), and using the green channel as a mask to apply softening. I find that this gives a very natural-looking softening in just the right areas of skin. You can also add a texture layer to add some texture back IN after you’ve softened the skin. This might seem counter-intuitive, but sometimes it looks good to remove the “real” texture and add “fake” texture in for a very smooth, even skin appearance. In addition, I usually add a brightness/contrast layer once I’ve softened the skin, too. This is because adding the softening can also take away some of the natural shine of the skin, and by adding the brightness layer, I can get that back in. Obviously this is not something you would do on each and every portrait — advanced techniques are usually done on those very special portraits on which you’re willing to spend a lot of time and energy. Usually, to be honest, I love people just the way they are, wrinkles and all. For my everyday pictures of myself, my family and my friends, I don’t soften skin. But clients don’t necessarily love to see their wrinkles highlighted by bright lighting, so softening can come in VERY handy! And sometimes, like when my 19-year-old skin is just pretending to be 41-year-skin, I might pop out the action and run it on my own photo. I wrote an action using this sophisticated green channel technique that is available for CS2+ Photoshop users at Pixels & Co.Unfortunately, I cannot make that technique available for Elements, because the Elements program does not allow channel splitting on RGB files. However, you can still use the Gaussian Blur and Surface Blur techniques in Elements for skin softening! 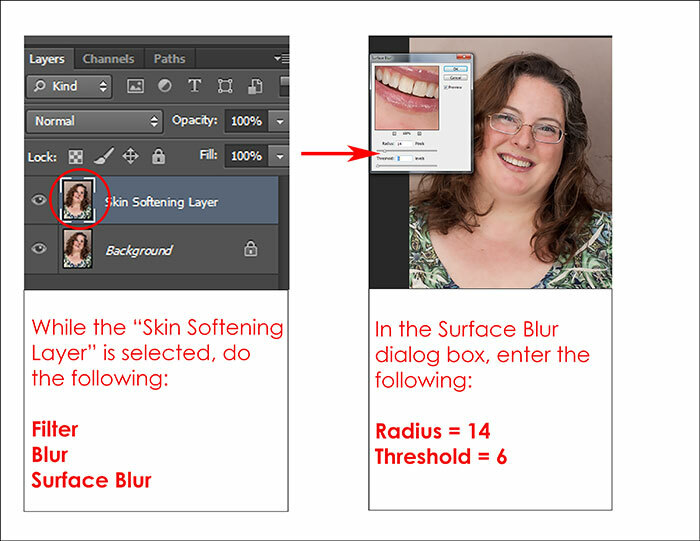 In fact, the action that runs in Elements uses the Surface Blur technique. If you do want to buy my action at Pixels & Co, I promise that I will be available to help you use it if you’re stuck, confused, or just a first-time action user. You can IM me through Pixels & Co or send me an email through this site, and I will get back to you ASAP with advice. I really love using actions, and I hope it can make your workload easier, too! Thanks for reading along, and have a great day hanging out and/or softening skin.